If Black Swans were a shock to the early european settlers in Australia, I really can't image the impact that this bird would have had. 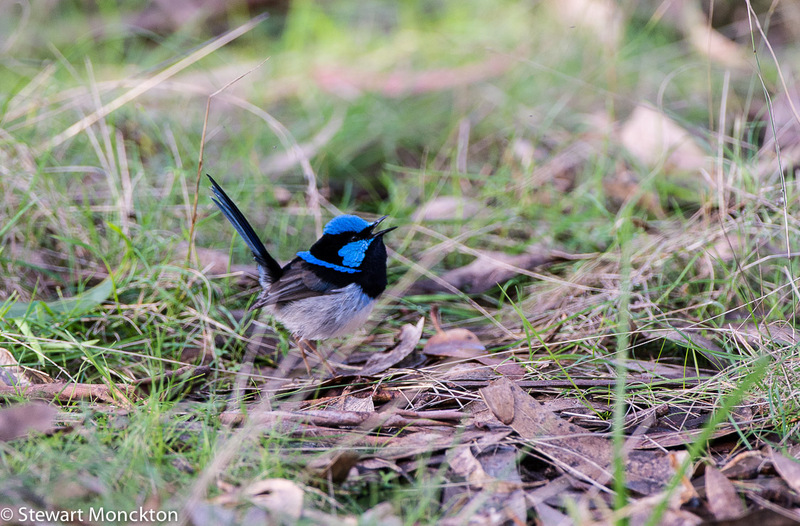 This is a male Superb Fairy Wren (Malurus cyaneus) singing its heart out to let other know who is boss. These birds are tiny as mice, and just as fast. They tend to gather in family groups, so it is rare to see one on its own. 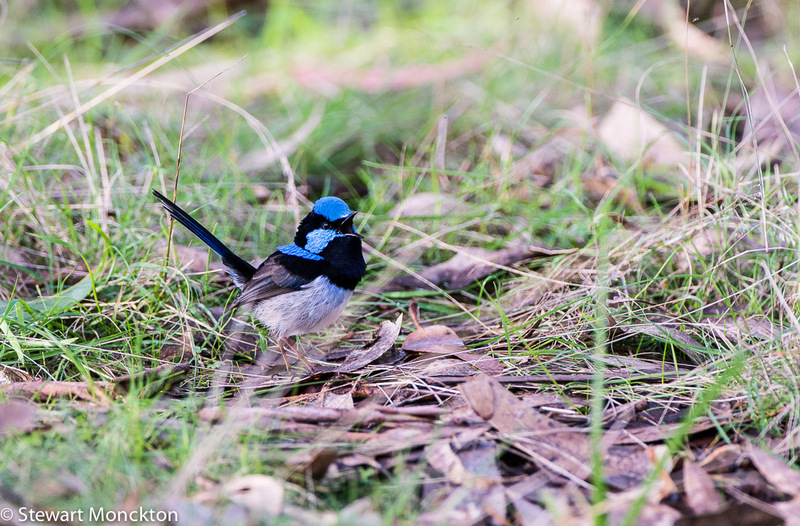 While not as vocal as some wrens, these fairy wrens make up for that in colour. This is the typical "blue wren" of South-East Australia, and one day I hope to be able to get decent images of some of these other species. I don't have time to do much more today - so, sorry for the short post! That is electric blue! Neat little bird! What a gorgeous little bird. Interesting as well. Wrens really do take on many shapes, forms, colors and make a variety of sounds. Great group of birds. Love the blue coloring on this particular one. Beautiful! I've not seen one before. Wow what a gorgeous bird. You don't have to do more, this beauty is enough!! A colorful little beauty indeed, Stewart!! Nothing wrong with short posts and besides, look at your great pics!!! wat is hij mooi wat een geweldig mooie kleur heeft hij. Great photos. Fairy Wrens are my favorite birds! What a pretty bird! Love it's bright shade of blue. Nice photos! I want five of them! They're beauties. I wish we had them here in Kentucky. Stunning colours. I bet they thought it was from somewhere exotic! I've also kept it fairly short today. I just love these tiny birds, they are so sweet! That blue colour doesn't look real. That is a stunning blue! Very cute! Just gorgeous and one of my favorite birds from your country. Lovely photos, Stewart. Thanks for hosting, enjoy the rest of your week! I love the Fairy Wrens...all species! The long tails and colors are just gorgeous. We don't really have anything similar here. It seems just not possible to even try to imagine a more beautiful bird! Wonderful to see! Stunning color. Fantastic captures, Stewart. A bit nicer looking than the little brown wrens the northern hemisphere gets.............! Stewart, if I didn't know better, I would guess that you had entirely made up this wren! It is outrageously colorful, beautiful photos of a stunning bird. How colorful he is! I wish we had birds with such colors! This is my first time to visit your blog. I am linked up to your Wednesday link and will start to follow this awesome blog! I have so much to learn about birds! Kurz, aber prächtig, so einen Vogel habe ich in Deutschland noch nie gesehen, gibt es auch wahrscheinlich nicht ! They really are beautiful! How I wish I could see them in my garden. Lovely to see them here though Stewart. I love how stunning some of our most common suburban birds are. That said, I've never managed to get such lovely shots of these flighty, bouncy little birds - your pics are great! wow- absolutely stunning bird.....my canada geese are so drab compared to this little wren!! Lovely shots of these colourful wrens, Stewart. They are just gorgeous little birdies!! Such a real beauty. Is there another bird almost hidden in the foreground? What a colorful wren! Love those twitchy tails--so much personality. You have the most brilliantly-colored birds over there. What a colorful little wren. I love those twitchy tails, so much personality. Thanks for hosting! What a bright blue! Nice to see. Well, you hadn't posted when I had to leave Tuesday so my plan was to link up when I got home that evening ... but, being the old poop that I am, I didn't remember until this morning (Thursday)so I have decided to save my post for next week. 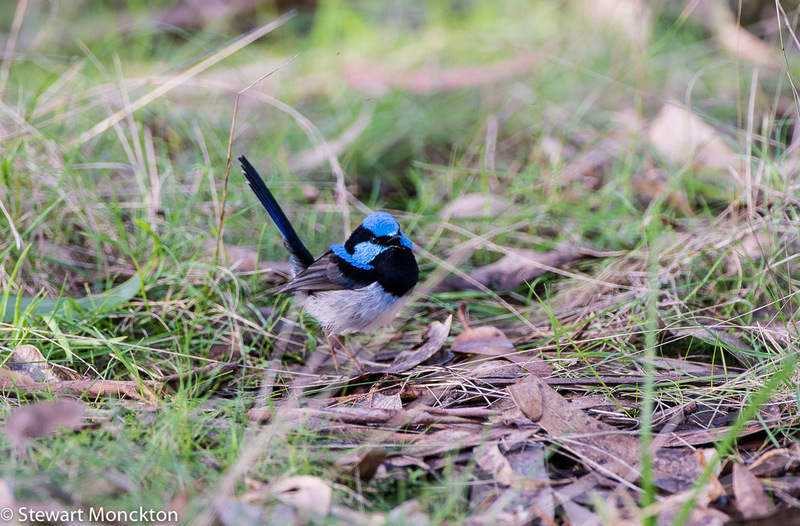 I do have to comment on your beautiful Superb Fairy Wren though. He looks just like our Wren with his mouth forever open except ... OMG, his coloring is gorgeous. How is it that you get all of the colorful birds down your way ... did we do something to deserve this deprivation? I know, we do have some beauties here, but you just keep coming up with more and more. Just another reminder of why you are on my Bucket list. Another great week at WBW ... Thanks, Stewart! He's just stunning! Little like the verdin I plan to post but so much more colorful! I just love his vibrant blue! Wow! That little Wren doesn't look real. What a beauty! The colors are amazing. It is also very cute!